The 2017 Summer Simulcast Season is underway! But how many of the series that we’ve been looking forward to are actually available for us to watch legally in the UK? Welcome to the Ballroom was the most eagerly anticipated title in a recent ANN poll…but, after a nail-biting wait, like several other potential favourites (Altair, DIVE!!) it’s now screening on Amazon Prime. Which is great if you’re a subscriber, but not so much if you wanted to watch it on Crunchyroll. And let’s not even mention Netflix at this stage. However…the brand-new streaming service HIDIVE is proving to be the fairy godmother here, with several titles that we thought we weren’t going to see appearing on their list. Exactly where this leaves Crunchyroll is another matter, let alone Funimation. So rather than dwelling on the disappointments, our writers are here to tell you about the shows they’re watching and to thrill us with their recommendations for what looks to be an enticing Summer Season! I’ll admit, upon first glance, this Summer Season was looking to be pretty slim pickings. A cursory glance at the list of shows didn’t seem to offer much of interest, and what did stand out seemed to come with caveats, such as Kakegurui and Fate/Apocrypha being licenced by Netflix, meaning they won’t get legally streamed until months down the line, or NTR: Netsuzou Trap being only 8 minutes long per episode. However, after some digging, I still managed to come across a few diamonds amongst the rough. Currently, my pick for the best anime this season has to be Princess Principal, a rather unique show set in a steampunk version of 19th century London, fractured into an East and West with a wall dividing the two factions, eerily, and no doubt purposefully, reminiscent of the cold war. 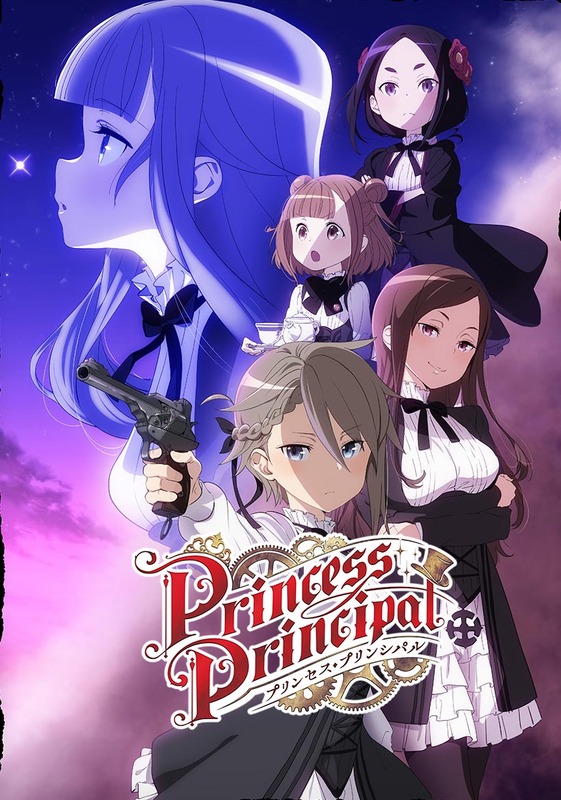 Keeping with that theme, Princess Principal follows a group of spies masquerading as high school girls that have infiltrated the opposing side who use espionage in order to carry out orders from their government. The whole espionage and spy angle that Principal takes is what makes this series a real standout for me, as it really is unlike anything I’ve seen in an anime before. It’s incredibly interesting, with the second episode in particular having some good tension that really keeps you engaged. Add in some top notch animation from 3hz (the studio behind Flip Flappers, one of my favourite shows of last year) and definitely the best opening this season, and Princess Principal is almost certainly one to keep an eye on. Last, by by no means least, is a sequel to one of my favourites from last summer, New Game Season 2. 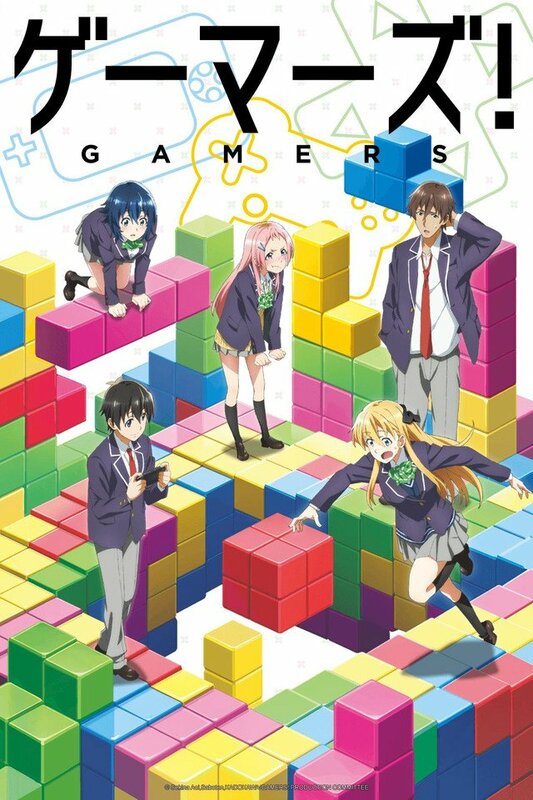 This Slice-of-Life comedy about a game development studio was a real surprise when it aired, managing to be a fair bit better than your average cute girl show, actually developing the cast and having some semblance of a plot, which is pretty rare for the genre. Season 2, so far, has not disappointed, quickly getting back to what made the original so great in the first place: the characters. Despite the fact only two episodes have come out at the time of writing, the second season is already looking to outshine the first, with the second episode being a spectacular bit of development for Aoba and Yagami, and I can only hope it continues the upward trend. Like Lemon, when I first glanced over the Summer Season shows I was left unimpressed. This time of year I always find myself shorter on time and so don’t have the patience for anime that are going to be less than stellar, so I’m also faster to drop new shows and just not give a series a chance. However, although I didn’t think I’d be watching much, I’ve actually found myself with a couple of firm favourites that I’m going to stick with. First up we have comedy series Gamers! which tells the story of Amano Keita and the gaming club at his school. He lives his days peacefully playing video games to pass the time, but when he encounters Tendo Karen, president of the gaming club, his life suddenly changes. Is it possible that this club could be the one place where Amano can truly belong? So far I’ve seen the first two episodes of the series and found myself really impressed. The animation isn’t always great for the characters (it’s a bit basic really), but the comedy more than makes up for it. It’s jam-packed with references to popular Japanese games, which is the kind of thing I warm to really easily. I think Gamers! could be one of the best shows in the season, if you like this kind of thing anyway. Otherwise I’ve found myself watching In Another World With My Smartphone which is based on a popular light novel series (being published in English by J-Novel Club). The plot revolves around Touya who is given the chance to live out his days in a fantasy world after God accidentally killed him with a bolt of lightning. To further make up for him being killed so young, God gives Touya the chance to take one object of his choosing to the new world with him. Touya decides to take his smartphone – and so begins a story of magic, mystery, and overpowered protagonists. Thanks to God giving Touya’s basic abilities a bit of a boost, he turns out to be exceptionally good at just about everything! However, at heart In Another World With My Smartphone is a comedy series and so Touya’s abilities don’t matter too much in terms of good plot development. When I talk about the light novels I like to compare them to KonoSuba, but with characters who are actually capable of accomplishing something. So far the anime has proved a little bit slow, but if you find yourself a fan of this genre like I am then I think there is plenty to like here. Both Gamers! and In Another World With My Smartphone can be streamed on Crunchyroll in the UK. I always approach each new season of anime with a lackadaisical attitude, and this summer was no different. It’s hard to get excited about individual titles when they might end up being region locked or exclusive to a service without any apps to aid viewing (ahem, HIDIVE). Or they could just end up far weaker than I expected, like the international superhero collaboration The Reflection. Still, it’s been a pretty fantastic season for UK-friendly simulcasts in general, and I’ve had a devil of a time sampling everything when each series seems to be exclusive to a single streaming platform. 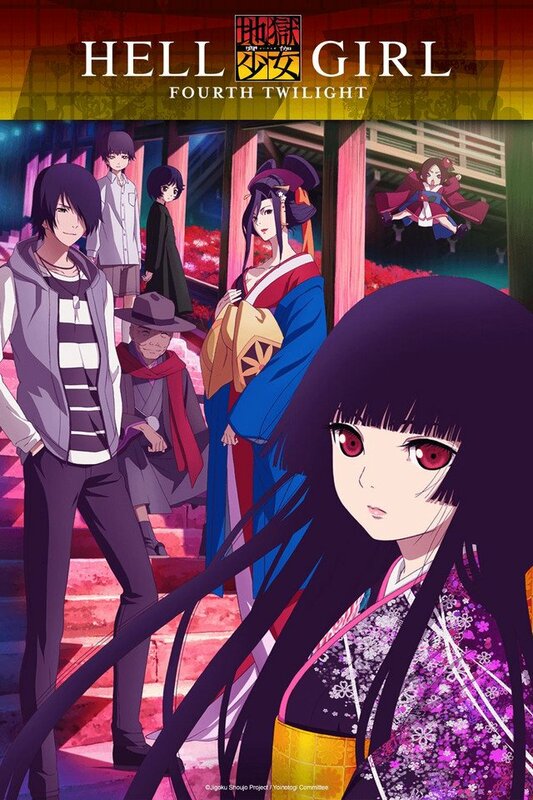 The only new title I was paying attention to from the beginning was Hell Girl: Fourth Twilight (the fourth season of Jigoku Shoujo); I was a huge fan of the previous seasons and to see it miraculously coming back after a long absence felt too good to be true. So far, it hasn’t exactly set my world on fire, but that isn’t going to stop me tuning in each week to see more people being cruelly cast down into hell. At this point, my favourite titles are as completely out of left field as usual. 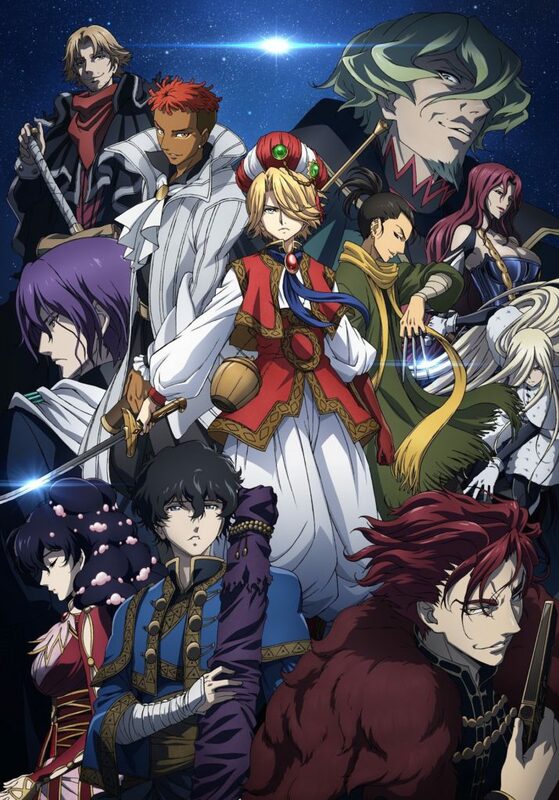 The first is Altair: A Record of Battles (Shoukoku no Altair), one of Amazon Prime’s exclusive series. I would hesitate to call it a truly high quality title, but its blend of complicated politics, hot-blooded teenage angst, sinister rivals and well-trained combat eagles has certainly managed to get me hooked surprisingly quickly. It’s a fantasy adventure which appears to be based on the antics of the Turkish Ottoman Empire; a setting seldom seen in anime. It’s scratching my historical fantasy itch nicely without trying to shoehorn in any of the current anime tropes. My other pick is Tsuredure Children, which is jam-packed full of all of the things I usually complain about when I’m watching anime. 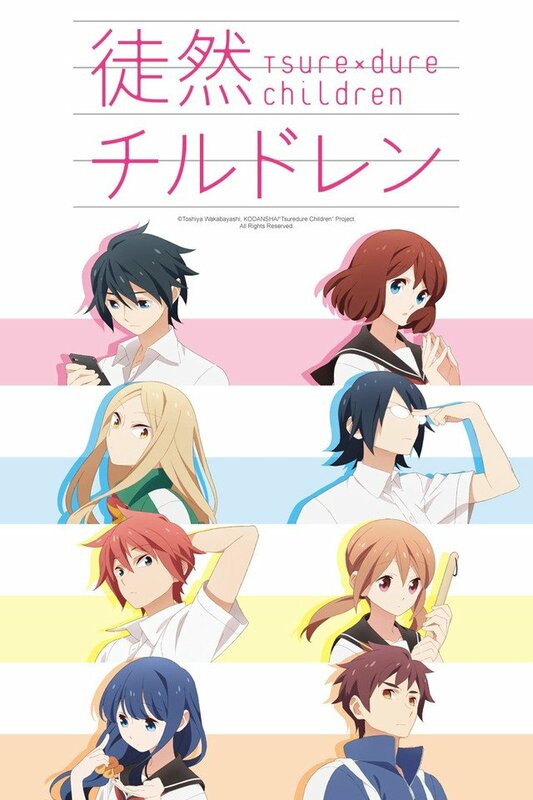 Flustered schoolgirls, romantic confessions which go absolutely nowhere, the usual scenes of school clubs; this show has it all, yet Tsuredure Children is actually a charming comedy which is far more than the sum of its parts. It takes the form of an assortment of vignettes focusing on various different couples (and potential couples) dotted all around the school, and the characters have so much enthusiasm that it’s impossible not to want their romantic dreams to come true. The comedy ranges from adorable to borderline lewd; it might not be for everyone but it definitely hit the right notes for me, and I’m going to be tuning in regularly from now on! A brief word in praise of HIDIVE. Although I’m currently watching on the laptop, the subtitles are good (there’s choice of colour and format) and the sound is excellent so the whole viewing experience thus far is distinctly promising. 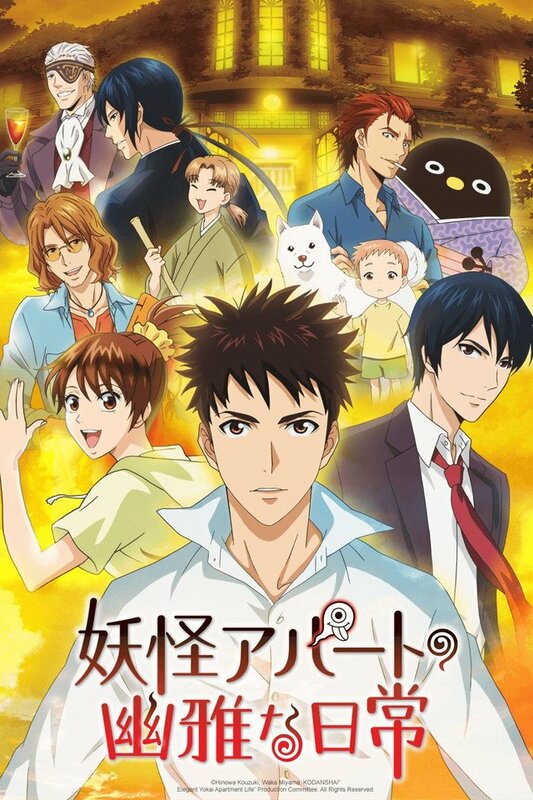 I have a soft spot for series that mingle everyday life with the supernatural (The Morose Mononokean, Poco’s Udon World) and Elegant Yokai Apartment Life (Crunchyroll) has not disappointed so far in that respect. Sixteen-year-old Yushi Inaba finds himself renting a room at the creeper-covered old-style house (it’s cheap!) when his new school dorm burns down. Needless to say, some – not all – the other occupants are distinctly ‘unusual’ from the ghostly little boy Kuri and his dog Shiro to Ruriko-san the cook who produces delicious food. Although this might still settle down into a ‘yokai of the week’ series, the implication is that Yushi – who has lost his parents – will find a new family in which he feels accepted and valued, albeit a rather unusual one! Traditional in character design and storytelling doesn’t necessarily mean dull and I’m enjoying this show very much so far (it’s based on a light novel series). Welcome to the Ballroom (Amazon Prime) The manga by Tomo Takeuchi on which this highly anticipated show is based is unusual in itself in being a shounen story about ballroom dancing, not basketball, football or superheroes. Much has been expected of this series and it’s well worth watching even though, as yet, I don’t feel it’s quite delivering the goods. I’d hoped for much more from the music (which doesn’t begin to compare to the wealth of new material composed for Yuri!!! on Ice) and the Opening “10% roll, 10% romance” by UNISON SQUARE GARDEN is disappointingly banal. A ve-ery slo-ow version of the Skaters’ Waltz accompanies Tatara’s first efforts on the dance floor. The Opening animation also highlights the show’s problem: the character designs, which are faithfully based on the manga but accentuate the impossibly long (ostrich) necks of the dancers and the grotesque fixed expressions on their heavily made-up faces when in competition (more Titan than Tiara). Maybe, however, this is the point that Takeuchi’s making about competitive dance? The drama of the show is, however, developing nicely as aimless high school student Tatara Fujita suddenly finds a purpose to his life as he’s drawn into the rivalries of the world of ballroom dancing. His struggle to succeed is depicted as a sweaty, agonizingly blister-filled uphill struggle, punctuated by moments of inspiration. Tatara has potential. Ballroom dancing ‘speaks’ to him. Which is why I wish the music (Yuuki Hayashi, possibly too busy working at the same time on My Hero Academia) would tell us what he’s feeling instead of plodding or resorting to clichés. Welcome to the Ballroom is streaming on Amazon Prime. I can’t resist slipping in a mantion that Crunchyroll also has the return of an old favourite: Saiyuki Reload: Blast which continues the rip-roaring adventures of the gun-toting monk Sanzo and his three companions as they fight demons and based on the popular manga re-telling by Kazuya Minekura of the Journey to the West. Funimation UK is also streaming this with a dub and a new cast, including David Matranga as Sanzo. The Japanese version retains the original cast, with the formidable Toshihiko Seki still playing Sanzo. Saiyuki Reload Blast is streaming on Crunchyroll. There are other series worthy of mention that we’ll return to discuss at Anime UK News, the ongoing (and very enjoyable) My Hero Academia and Rage of Bahamut Genesis: Virgin Soul to name but two. But what’s caught your attention? Do you feel this is a turning out to be a disappointing season? Has something we haven’t mentioned caught your eye? We welcome your thoughts and comments!